I love ribs! 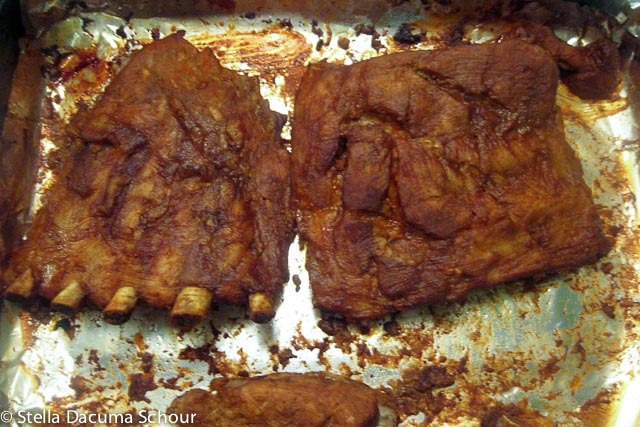 There’s nothing better than having a nice rack of ribs to share with family and friends. Marinate this baby DAYS ahead of baking time and you will surely have finger licking goodness. Minced Garlic – as much as you like. I think I used about 5 cloves for 1 rack. add more if you like. Cut slits on both sides of the ribs. 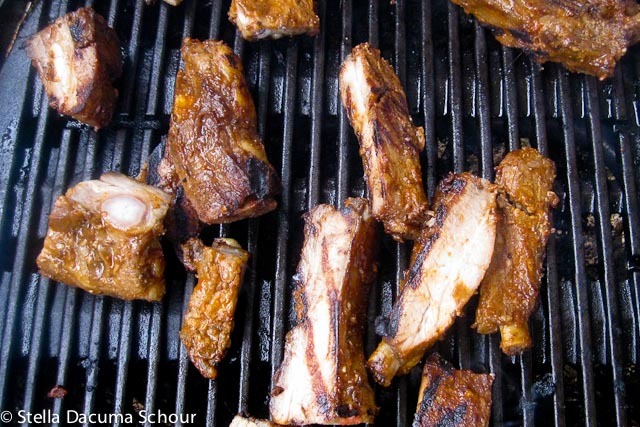 This tenderizes the ribs and allow for more marinate to seep into the meat. 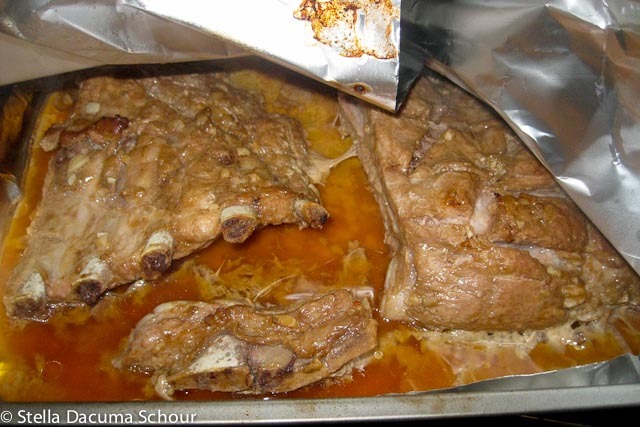 Put your ribs in the bag, THEN ADD about 2-3 heaping tablespoons of the sauce and the minced garlic. Massage the meat while evenly distributing the marinade. 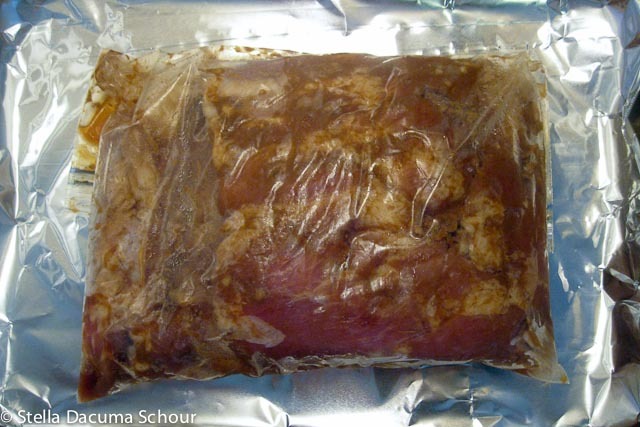 Refrigerate for at least 24 hours, and turn the bag every couple of hours. 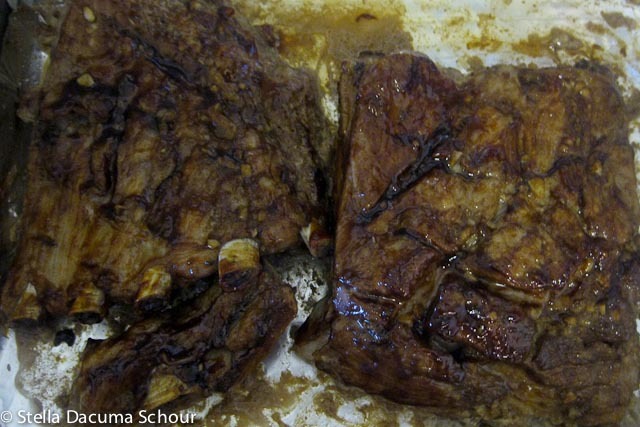 This one marinated for more than a week. Preheat oven to 400F. 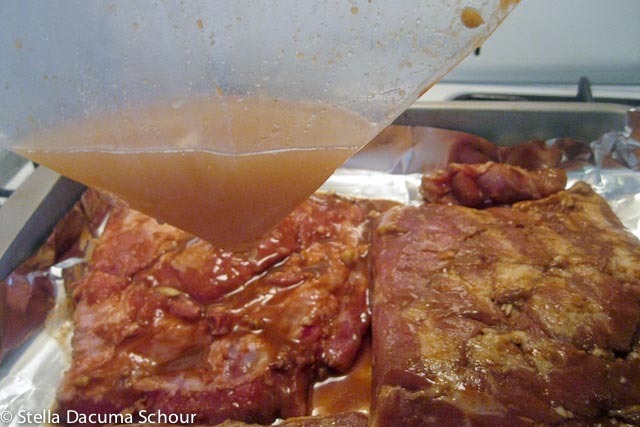 Place ribs on a baking pan and all the marinade, and add about 1/4 cup water in the marinating bag shake it around to get all the marinade out and pour into pan. Don’t waste flavor! 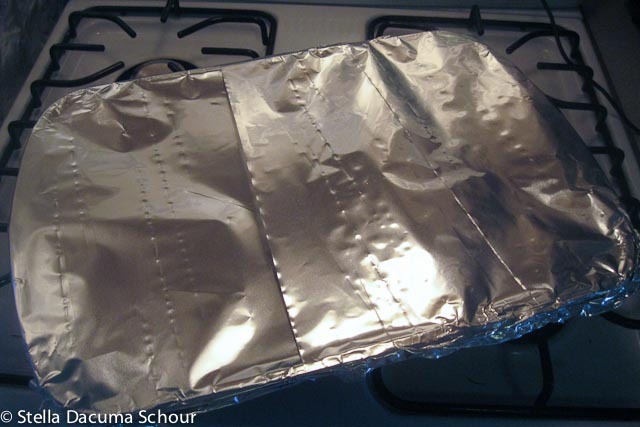 Cover the pan with aluminum foil and seal it tight. 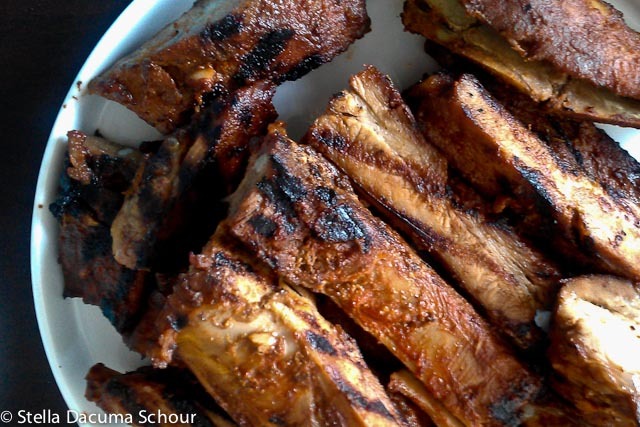 The ribs will be steaming with the goodness of the marinade. Bake it for 50mins at 400F. See how the slits have expanded and the bones stick out? This indicates how soft and thoroughly cooked the ribs are -YAY! 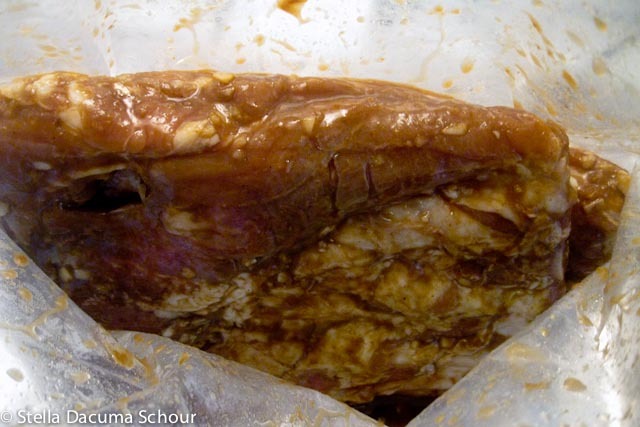 If the meat is in this state, pour out the jus/drippings and set it aside. You will need it later. 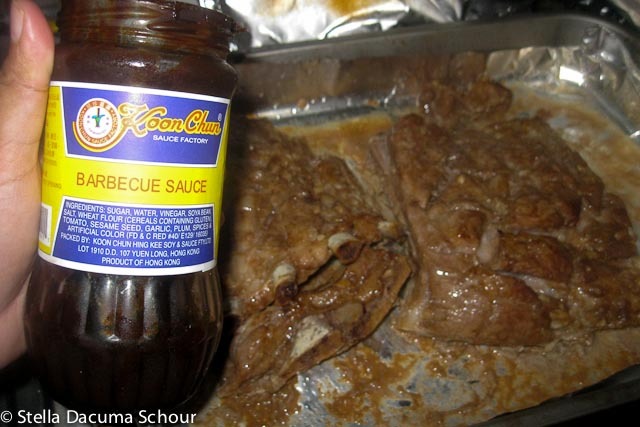 Baste the ribs with Koon Chun BBQ Sauce. I personally prefer this as it is a cheaper sauce and is not as viscous and sticky as Lee Kum Kee brand. It is also easier to apply. Put it back in the oven for 10 mins, at 300F. 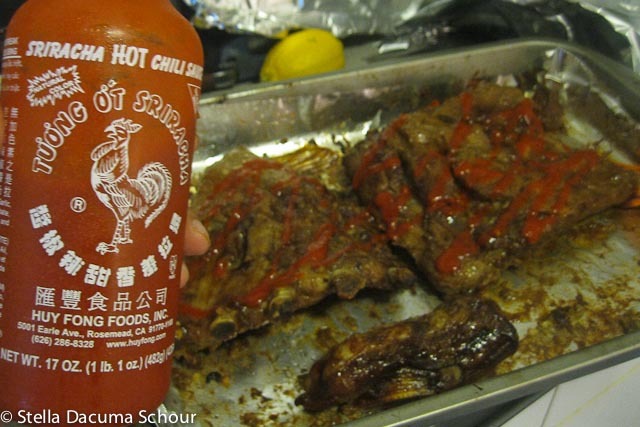 Baste ribs with Sriracha a and 10 more minutes in the oven. Let the meat rest covered for 20mins then cut it to portions. If serving the next day, refrigerate. If serving immediately, brush with drippings before serving. It is best to serve it with a side of white rice or noodles. Thanks for visiting!!! If you end up making it, please send me a photo!